I’ll bet you have one of the greatest jobs in the world sniffing all kinds of different fragrances every day and experience that with random passants. And either your nose has gotten overworked or you still have to train your nasal talents a little bit further since you totally absolutely have NO NOSE for spotting people who: 1. HATE PERFUME and 2. ARE TOTALLY HEAVY ALLERGIC to chemical liquids also in the form of a vaporizer slash spray. 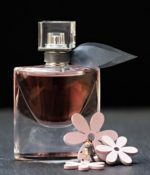 Let me give you an unwanted advice to develop your perfume skills a bit more. When you approach or rather in your case attack a passant with your terrible toxic little f***ing bottle; you first scan from a large distance who is going to pass by you and determine if the person(s) in question are looking interested in your direction or not. In this case: NOT. Get that?! Great, next: by the time someone is near you; you either shut the f up (when they NOT seem interested) or you start a subtle chat and again in this case: WE WERE NOT INTERESTED! Get it? NOT INTERESTED!! You are not going to throw yourself on my lap in my (temporary) wheel chair to subsequently suffocate me with scented gas!! Especially when I screamed NO I AM ALLERGIC to perfume in answer to your f question “can I let you smell this…..”. And TOTALLY when my daughter also yells “WE ARE BOTH ALLERGIC!” you have to BACK OFF girl! And what in the name of the Universe is going on in your mind when we all four shouted at you: “WE ARE ALL ALLERGIC WOMAN!”,”FOR REAL”, “NO JOKE!”. What did you think? Let’s kill the goddamn perfume haters? And what’s up with the “Yeah right!” part? We all were so stupid to respond you on that and scream “Reallyyyyyy”. Spraying perfume to my face would have been the same effect as if you would be spraying a large amount of insecticide in my face and then you would have me killed like a bloody mosquito girl! Next time you hear someone begging to: “Pleeeeaassseee don’t spray perfume in my face”; please be aware that there are people walking around, or wheeling around, with immune system problems which can cause severe allergies from all kind (especially for perfume girls) and REALLY can die of the smallest amount of fragrance. And most important of all: they didn’t ask for that to happen as well as they don’t ask perfume girls to spray them to death, totally for FREE. Read also: They ignored me and I wasn’t even looking arrogant! !